Mr. Holmes: What? Can you speak up? Terrible, cringe-worthy jokes aside; this was a nice surprise among the war between summer blockbusters. Bill Condon has such gems on his resume as “Twilight: Breaking Dawn Part 1” so he has had some hate in the past few years. But this is far from that turd and this is quiet, dialogue and character driven and it’s constructed as a poetic piece for Sherlock Holmes’s last mystery he tried to solve and how it ultimately broke him. Very well done, Mr. Condon, you killed it. At least you weren’t trying to direct actors in a crappy vampire story. I would say maybe a bit more to the story. The story can appear a tad thin as this movie does focus on the mystery, which is fine, but there is also a portion to where Holmes goes to Japan and I wish there was a bit more to that story line. Ian McKellen does a fantastic job as an older Sherlock Holmes and makes this interpretation really vulnerable and we get to see a more emotional side to this character. And it is quite depressing to see why he didn’t do another mystery after the one presented. He is the star and rightfully so. 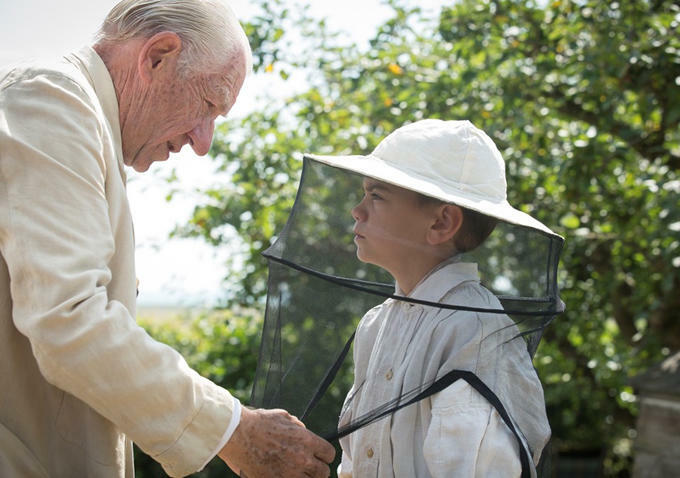 Laura Linney and the kid actor playing her son were fine; but it’s really hard to go against Gandalf and Magneto. All the supporting cast isn’t really memorable (maybe besides the kid) and there are fine, but some of them felt a bit underdeveloped. I have to admit that everything shot in the U.K. is simply elegant and beautiful to look at with lush green pastures and an old school, rich look of the towns and cities. This is no different. It’s beautifully shot and you can tell it was shot in the U.K. Nothing with the way it was shot, but in some scenes there are unnecessary angles and you can tell they were trying to keep the film lively. It’s well paced, but slow, and it feels like a Sherlock Holmes mystery. Besides the Robert Downey Jr. adaptations, every Holmes movie has the slow-burn feeling to them really drawing out the mysteries to solve. On the same note, it is a slow-burn; like Foxcatcher slow. I didn’t find it to be a problem since I was engaged in the story, but I can see people getting bored with its pace. It’s a dialogue- heavy film. Overall: I enjoyed the story and performance from Ian McKellen immensely and it had a lot of dark, mature moments that felt right for an older Sherlock Holmes. Its slow-burn might turn off some people, but this was an engaging surprise that nice among the summer movies.